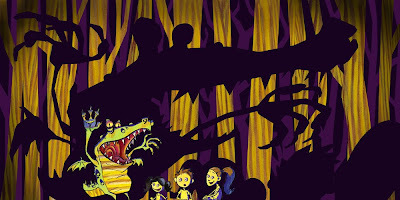 "When you’re a dragon your campfire stories might be too scary"
This is one I've been working on for a book I wrote called The Trouble With Being a Dragon. Let me know what you guys think. This is amazing! Great shadows! Absolutely a hazard of being a dragon! This is great! Very dramatic! great... Yep I guess dragon tories can be scary. I wonder what scares them? Awesome. I love those yellow trees. I must see more of this book. The contrast of shape and pattern is outstanding! I love how perfectly, over-the-top dramatic this is, even though the dragon himself isn’t so terribly menacing -- Very appropriate for the story! I really want to see the other hazards. And I would pay money to think like this...wonderful!